Corrosive cleaning products and me just don’t go together. I remember a long time ago I was cleaning the toilet and I unwittingly mixed two harsh cleansers together. All of the sudden the bathroom started to fill with toxic fumes. My ex and I grabbed the kids and ran outside. The fumes and strong chemical smell filled the entire house. It did eventually clear out after a number of hours, but I have been traumatized since that day and live in fear of chemical cleansers. I am also allergic to latex so I can never wear those stupid yellow gloves that you are supposed to wear when you are cleaning. I end up using just natural products or soap and water, but the task usually takes a lot longer than if I used the more potent cleaning products. However, I am happy to say that the gloves are off- literally! Gloves Off is a safer and tougher alternative to traditional cleaning products. It is made with non-toxic ingredients and is environmentally friendly. The difference from other green cleansers is how well it actually works. It really does compare to the corrosive cleaners in performance and will work on difficult or hard to clean problem areas in your home. I received two products from Gloves Off to try- Natural Action Disinfectant & Cleaner and Tough Stain & Paint Remover. 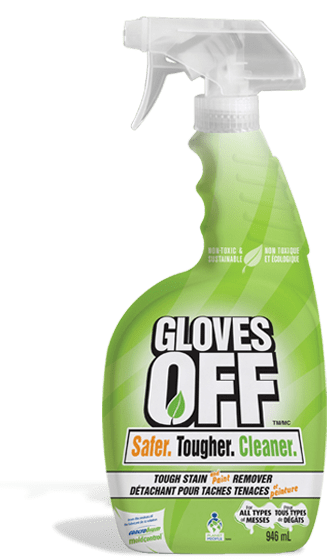 The Gloves Off Natural Action Disinfectant & cleaner is a new all natural, non-toxic product that effectively eliminates bacteria, viruses and odour causing germs WITHOUT ammonia or bleach. It is actually registered disinfectant with Health Canada which ensures that it kills 99.9% of germs. Its made from essential oils and plant extracts. It works great in kitchens, bathrooms, pet areas, children’s items, waste bins, and athletic gear. I decided that my kitchen would be the room to first room tackle with this cleaner and see how it worked. I used it on my stove top and fridge surface. The fridge is black so it always gets icky fingerprints all over it. One spray and swipe with a paper towel and all visible smudges were gone! However, the most impressive feat was on the inside of my fridge. I cleaned out my entire fridge by emptying out all the food (and throwing away anything that had expired). I sprayed all the shelves and wiped. I was surprised how easily some stuck on food stains came off. There was some jam that had spilled and I figured that it would be the hardest to get off. However with the cleaner, it was literally gone in just a few wipes. Amazing! The only thing I really missed was a nice smell…maybe something citrusy would be nice. I am not sure if that would be adding in chemicals so its really not a big deal to have a lemon scented cleaner- just my silly preference! This is an awesome green product that stands out in performance. It costs $5.99. The Gloves Off Tough Stain Remover is made with safe and environmentally sustainable ingredients. It rapidly penetrates and lifts tough stains like wine spills, soap scum, pet stains, grease marks, etc on hard surfaces, fabrics and carpet. I decided to try it out in my car which needed some TLC. I am not the most graceful person and am forever tripping and spilling drinks (especially coffee) all over the place. My car is no exception. The car mats were atrocious and needed to be done. I beat out the dirt and then gave it a good vacuum so that I was only left with the stains. They are mostly stains from food and drinks (I’m a messy eater too). I sprayed the Stain Remover on the stain and let it sit for a minute or two and then scrubbed it off. It came clean and looked like a new mat! This is another product that is great to have around the house since you never know when a spill will happen! It costs $7.99. 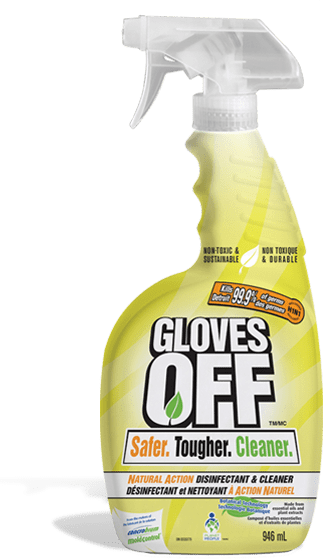 Gloves Off products can be purchased in Canadian Tire stores across Canada. Visit www.glovesoffclean.com for more information. They also have a coupon for $2 off Gloves Off Carpet Care or Tough Stain Remover on their site so make sure you take advantage of that.